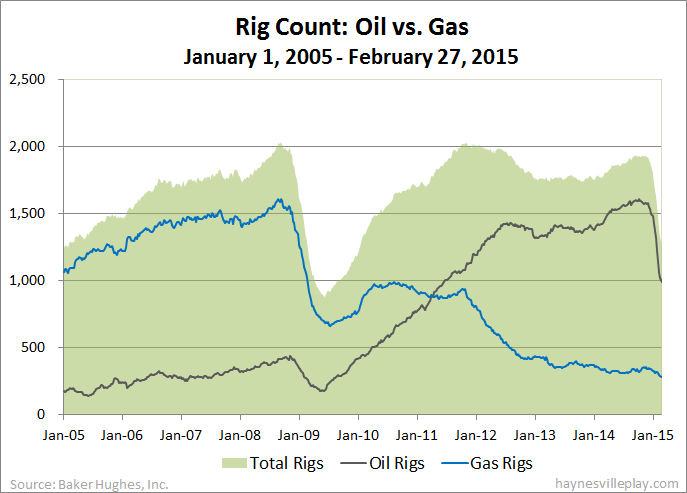 The Baker Hughes U.S. rig count was down 43 this week to 1,267. Oil rigs were down 33 to 986, gas rigs were down nine to 280 and miscellaneous rigs were down one to one. By type, horizontal rigs were down 33 to 946, vertical rigs were down nine to 194 and directional rigs were down one to 127. Among gas rigs, horizontal rigs were down four to 210, directional rigs were unchanged at 44 and vertical rigs were down five to 26. While everyone is focused on the plunge in oil rigs (down 589 rigs, or 37.4% over the past 12 weeks), nobody is paying attention to the fact that the gas rig count is at its lowest point since May 7, 1993, almost 22 years ago. A kid could have been born, educated and graduated from college in that time span.